Four female journalists whose radio station is the main source of information for many people, and is supported by our partners. 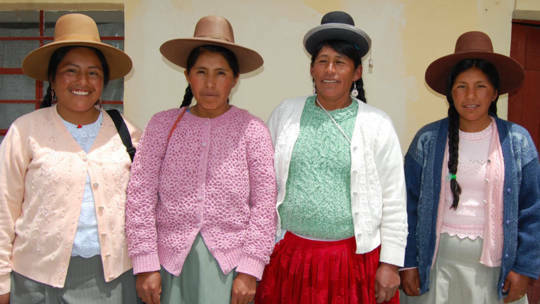 CAFOD has worked in Peru since 1968. Our programme has been shaped by two main influences: our relationship with the Catholic Church and the internal conflict of 1980-2000. During the years of violence, the country was ruled by an authoritarian and corrupt regime and many thousands of people were killed by the army and guerrilla forces. Nearly a quarter of the population in Peru lives below the poverty line – mainly the informal workers and the indigenous communities in rural areas – and they still have little voice and influence in Peru’s political system. Mining and dam building have created widespread social and environmental damage and are threatening the livelihoods of many farming communities. Peru is the third most vulnerable country to climate change worldwide. As a result, water shortages are likely to increase in the near future. Today, we work through ten partner organisations in Peru. Our programme is working with communities and advocacy groups, helping them to address environmental concerns related to mining and press for greater accountability by the government and private sector. We are also supporting education and job-creation in the shanty towns of Lima, especially with women, young people and children. Berta Quispe Gutierrez has been receiving training from our partner. Through the training she has learnt about cake baking and business skills so that now she can help support her husband and family. I like these workshops. They help us learn about production. The workshops have also helped me to talk and express myself. I was timid and shy... but thanks to all these people who have treated me so well, now I’ve learned to speak like I’m speaking now, looking into your eyes, I couldn’t do that before. I always advise my children to learn because what you learn no one can take away.